Last night we had a great show. There were people waiting outside before we even opened the door! It ran from 3pm to 9pm, and there was a constant flow of people. 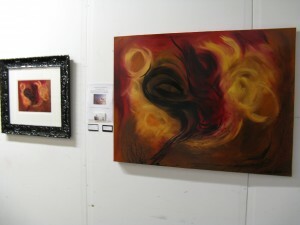 I had several pieces up, including Birdsong and a framed Birdsong limited edition print. 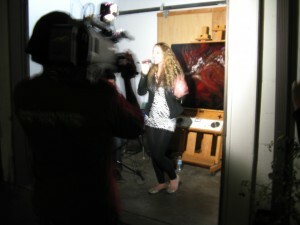 At the end of the evening, Auret Esselen gave a singing performance which was filmed for TV. Birdsong with a framed print. The sheet in the middle describes the music / art collaboration between Barry Ostash of STAVOC, Steven Kitchen of Dephorm, and myself. A small device for playing a sound clip of the song was included on the sheet. This beautifully framed limited edition Birdsong print belongs to one of my collectors. She very kindly loaned it to me to hang at my show. 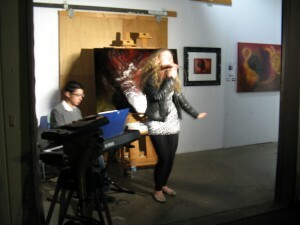 Auret Esselen performing in front of my Bonanza painting, while being filmed for TV. Another shot of Auret singing. 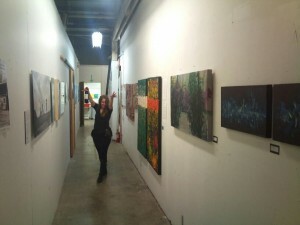 Stacy Sakai in the hallway of art, at the end of the night. Photo by Barry Ostash. 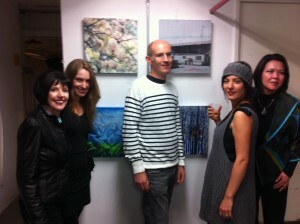 The artists in the Artistrun Collective art show! Left to right: Carolyn Kramer, Stacy Sakai, Jim Landecker, Rojia Dadashzadeh, and Liza J. Lee. Our collaborative pieces combining painting and photography are behind us. Photo provided by Carolyn Kramer. 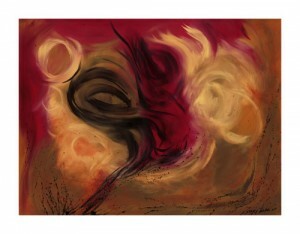 The Birdsong painting is now available in limited edition prints! 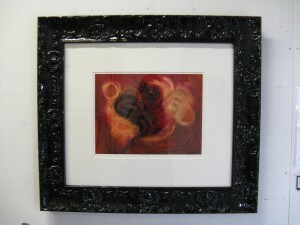 Each of these high quality fine art prints is numbered and signed, and comes with a signed Certificate of Authenticity. To order a print and arrange for shipping, please send me a message using the ‘Contact’ tab above. 'Birdsong' now in Ltd Edition prints! 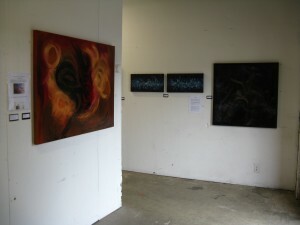 The creation and development of this painting was also photographed, and is now featured in a STAVOC music video. The lyrics in the song were written specifically for this painting! The music video can be viewed on YouTube. Enjoy!